Class Offered One Day Only on November 10. Register Online Today! CORPUS CHRISTI, TX – The Corpus Christi Parks & Recreation has added Puppy Yoga to its offering of wellness and fitness classes this fall at The Water’s Edge in Corpus Christi’s downtown bayfront. We invite you to come out and transform your mind, body and soul with these classes for an improved and healthier lifestyle! 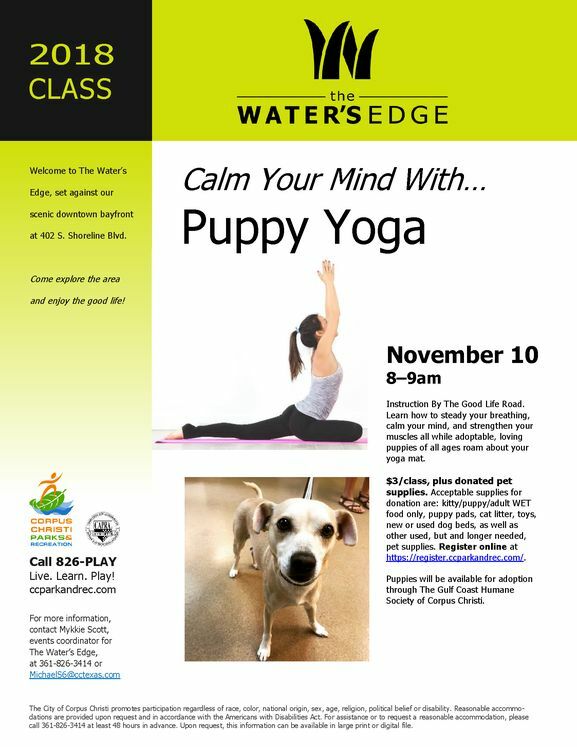 Puppy Yoga Class will be offered one day only on Saturday, November 10, from 8 - 9am at The Water’s Edge located at 402 S. Shoreline Boulevard. Come, have fun and relieve stress while engaging in movements designed to improve balance, flexibility of muscles and tendons. You will learn how to steady your breathing, calm your mind, and strengthen your muscles all while adoptable, loving puppies roam about your yoga mat. Professional yoga instruction will be provided by The Good Life Road, LLC. Register online for $3/class, plus donated pet supplies. The list of acceptable supplies for donation are: kitty/puppy/adult WET food only, puppy pads, cat litter, toys, new or used dog beds, as well as other used, but no longer needed, pet supplies. For more information or to register for this class, call (361) 826-3414 or visit www.ccparkandrec.com (The Water’s Edge). Puppies will be available for adoption through The Gulf Coast Humane Society of Corpus Christi.